PREDICTif Solutions, a Houston-based technology consulting firm, today announces its upcoming presentation at Oracle OpenWorld 2015. The conference, held from October 25 to 29 at the Moscone Center in San Francisco, CA, will be a premier event for business and IT professionals to learn about Oracle technologies through the interactions with Oracle and its business partners. PREDICTif’s CEO, Jeff Huang, VP of Global Sales, Karl Harrocks and OEID Practice Lead, Jimmy Philip will represent PREDICTif at the conference, meeting customers and Oracle colleagues.“This year we are very excited to have two of our customers, Wilsonart and Cox Automotive, speak on our behalf and share with our customers and partners their successes with PREDICTif. The Wilsonart story is featured on the September issue of Oracle Profit magazine, describing the incredible journey that Wilsonart and PREDICTif travelled together to build a fully integrated EPM, BI and Big Data solution” said Huang. A leading Oil and Gas Equipment services company. Lack of a BI competency center rendered uneven quality of delivered BI applications that resulted in slow performance and instability. Conducted a health check to identify areas of risks and opportunities, recommend remedial measures, and produce a master implementation plan and a roadmap to build an enterprise level BI architecture. Developed a master implementation plan and roadmap for an enterprise level BI architecture. PREDICTif Solutions was engaged to provide a 2-week health check. PREDICTif’s senior architects reviewed the existing BI infrastructure, made recommendations for improvement and delivered a master implementation plan for rolling out BI to the entire enterprise. Based on PREDICTif’s standard health check agenda and customer priorities, PREDICTif and the customer created a detailed agenda before the engagement. The agenda addressed both tactical and strategic aspects of the customers business. The tactical aspects were to analyze the existing BI solutions to identify areas of risk and opportunity as well as provide recommendations on both. The strategic aspect was to understand the customer’s business priorities and deliver an enterprise BI implementation plan. The two week agenda was filled with workshops, interviews and document reviews during which, PREDICTif’s architects met customer’s personnel from numerous areas of the business to discuss business objectives, current BI architecture and business user concerns. Conversations focused on areas such as data quality, data governance, data modeling, report requirement gathering processes, architecture, support/maintenance and technology best practices. The architects also discussed future plans, business initiatives, short term and long term business goals as well as technological direction in the BI and FPM arena. The tactical health check deliverable is in the form of a Microsoft Word document and a Microsoft PowerPoint presentation both of which outlined areas of opportunity, improvement and identified risks as well as the necessary steps to mitigate those risks. The architects applied PREDICTif developed and tailor-made data governance and data modeling best practices to the customer’s business and IT environment. A master BI implementation plan and roadmap was delivered in order to consolidate the dispersed BI architecture as well as establish an enterprise level BI infrastructure. The implementation plan included the steps to establish an enterprise level BI competency center and governance process. PREDICTif delivered considerable value to the customer’s return on the software and IT infrastructure investment. The health check’s findings and recommendations significantly improved both the performance and the stability of the customer’s existing BI architecture. The implementation plan provided a clear roadmap to establish an enterprise level, world class BI architecture. The customer completed all three phases of PREDICTif’s recommended implementation plan and the overall BI initiatives continue to gain adoption and approval from the business use population. A leading health management and diagnostic services and equipment company. As one of the leading construction multimedia companies, this customer is faced with the following challenges: inefficient central financial reports, reliance on manual inputs, and cumbersome Excel intensive reporting tool. With financial data coming from 8 different data sources, a central reporting tool to consolidate all the reports is needed. The business is presented in six platforms and each platform gets the data from its own data source. The chart of accounts is compiled from a string with over 20 characters. The accounts dimension hierarchy was set up in such a way as to hinder reporting leading to miss interpretation of data and errors in reports. Each of the six platforms has their own chart of accounts and reporting method making it difficult to consolidate in a single tool. Therefore, a lot of manual methods are involved in creating reports. Heavy reliance on Microsoft Excel to input budgeting data is present. As a Solution, PREDICTif Solutions proposes an end to end solution to centralize the financial reporting system to provide budgeting and forecasting for the organization. The objective of the project was to deliver a solution that leveraged TM1’s in-memory OLAP capabilities and simplified the monthly financial consolidation and reporting process. Centralized, efficient and ease of use access application which can reduce preparation time. Instead of spending time on preparing reports, users can now focus on analyzing data. Provide a proficient budgeting and forecasting web based process that allows users to input data at the line item level. After evaluating several world class solutions, IBM Cognos TM1 was selected for a number of reasons – one of them being that IBM Cognos TM1 provides a real-time approach to consolidating, viewing, and editing enormous volumes of multidimensional data. PREDICTif was engaged to provide an end-to-end solution delivering 25 Cubes with dimensions ranging from 5 to 15 in order to provide Financials and Assumptions models. Changes in financial forecasts, assumption metrics and indirect expenses were made via customizable Excel templates as well as directly through the TM1 interface. Reports created both in TM1 and Excel were readily accessible through the web with no additional effort. PREDICTif Solutions was able to create a set of multidimensional cubes utilizing OLAP technology that can dynamically slice and dice through data sources. Design a user-friendly excel input templates which can access through TM1 web. The cubes support consolidation and reporting of both budgeting and forecasting data as well as allocation. An automated data extraction using by TI processes (ETL) tool that can update multi dimensional cubes from 8 different data sources. Setting up different instances for security purposes and separate the finance consolidation modules, budgeting applications and compensation modules will be given access by corporate controller. Substantially reduce time spend on creating monthly financial reports. Reports are easily access and produce with little or no reliance on the accounting and IT department. Provide a real-time consolidation reports and offer an automated tool for producing annual budget and monthly forecast process. Provide power users training and knowledge transfer to the client so they will be able to build additional reports, budget templates and forecasting procedures out of the cubes. PREDICTif solutions delivered measurable results to the client. Now the client is able to provide “one version of the truth” in their reporting system. Customers can now use the centralized financial reporting cube to analyze data across six platforms and they now have an automated ETL process to update dimensions and cubes from 8 different data sources. The TM1 web based input budgeting and forecasting system also allows users across the enterprise system to input data at the line item level. The application significantly speeds up the budgeting and forecasting process and empowers users to create or modify input templates without IT department influence. Consolidated financial reports have obtained further reach as a result of the use of TM1 web. A leading seismic data-acquisition imaging and software systems company who assists petroleum exploration companies to identify and measure subsurface geological structures. The Customer used an out-dated solution that was under-utilized and deficient in terms of data mining and planning automation. As a result, the business was heavily dependent upon IT for both support of its existing solution and development of new functionality when the enterprise required. The software deployed was also 2 major versions behind that of the publicly released version and had run out of vendor support. Significant growth in its Solutions business units served as a catalyst to replace its manual, error-prone, labor intensive financial reporting and planning solution with a more automated, streamlined and efficient one. The company, comprised of multiple legal entities that span the globe, was challenged with having to manage all of its financial operations in a single, multicurrency environment. It also had needs to transform individual financial plans from a group of entities into a single, consolidated corporate level plan. All this made the existing solution severely limiting in terms of the ability to predict its revenue and costs for each of its business units. Ensure long term, advantageous total cost of ownership. PREDICTif led a systematic product selection process leveraging its extensive experience with EPM solutions, vertical specific evaluation criteria and its own, proprietary production selection templates to ensure a thorough evaluation was undertaken. PREDICTif led the preparation of the PoC, the coordination of the vendors and finally, the short-listing and evaluation/selection of vendors who best addressed Customer’s business requirements. Produced a high level roadmap and long term implementation plan for each technology so that the Customer understood not only the current state, but also the future vision of the chosen technology. The PoC was conducted in parallel by three vendors over the course of a two-week period. We aggregated all the gathered information and then, used PREDICTif’s weighted software selection criteria to contrast that against the Customer’s business objectives to render an option on a best of breed solution. Oracle utilizes updated and modern technologies, presents a strategic product development roadmap and enjoys both financial as well as organizational stability. Provided the business a solution that resulted in a significant return on investment. Business intelligence (BI), once a competitive differentiator, is now a commodity. Most companies have implemented BI solutions that provide historical reporting, dashboarding, metrics and scorecarding for past events. Companies know what has happened but the ability to know what will happen will be the competitive advantage that companies need to excel in this volatile and ultra-competitive environment. Predictability is the next step in the evolutionary process of Business Intelligence. Traditional Business Intelligence and data warehousing focus on strategic, long term decision support. While strategic Business Intelligence continues to be a requirement to support long range vision, Predictive Business Intelligence (PBI) takes business Intelligence beyond a process that has traditionally looked backwards and has been reactive in nature. PBI empowers the enterprise in realizing competitive advantages and provides the business with the necessary agility to meet the challenges of today’s rapidly changing business environment by mitigating risks and maximizing opportunities. PBI greatly improves both long term strategic decision making and near team operational decisions. The ability to make Predictive strategic decisions will separate enabled companies from their competition enabling them to capitalize on opportunities and reduce exposure to risk. Statistical analysis on operational and transactional data will provide insightful information on business trends and enable the business to make strategic decisions quickly and more effectively. For example, when a retail chain is determining whether to establish a presence in an unfamiliar territory, it could utilize growth data from other locations and combine it with the local data as well as current projection data to provide support for the decision making. The data might be sketchy and sparse, but statistical analysis will offer a sound basis for decision making. Other examples can be found in oil & gas exploration or pharmaceutical development projects for instance. These projects often entail long development cycles and considerable up-front cost the outcome of which has significant impact on the overall performance of the business. Predictive decision making will enable those companies to analyze more data in order to gain a complete view of the business cases and leverage proven statistical models to aid those impactful decisions. The completeness and quality of the data analyzed are critical to determine the accuracy of the prediction. Although companies in these verticals go to great lengths to develop elaborate risk management models to address common concerns, predictive business intelligence In support of existing risk management processes, provides a richer set of data and more interactive analysis to ensure a better outcome. With help from IBM Cognos Express and PREDICTif Solutions, JB Poindexter and Co. was able to upgrade, consolidate, and standardize their diverse reporting systems, saving at least $50,000-75,000 a year in hardware costs, and increasing productivity by 100-125%. J.B. Poindexter & Co., Inc. is a privately held diversified manufacturing company with operating subsidiaries engaged in the production of commercial van bodies, step-vans, funeral coaches, limousines, mid-sized buses, pick-up truck bed enclosures and tonneau covers, precision machined components and expandable foam plastics. The company operates with a decentralized management and operating structure. Subsidiaries have complete operational, financial and administrative responsibility, with professional and executive management support provided by the corporate staff. Jay Krishnamurthy Vice President-IT, J.B. Poindexter and Co.
J.B. Poindexter & Co. has grown significantly in the last few years, acquiring six separate business units. As each unit maintained its own staff, product lines, customers, as well as its own ERP system, reporting processes were difficult to manage. The business and corporate units had limited visibility into crucial arenas, such as performance at plant levels, costs, margins, overhead, material savings, etc. 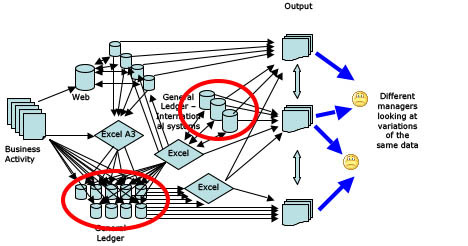 Due to the nature of their sustainable growth, they lacked consistency in information and standardization processes. In addition, the information reporting and planning processes that were in place were antiquated. With manual and laborious systems in place that included spreadsheet formatting, crucial business information was often inconsistent and difficult to come by in a timely manner. J.B. Poindexter & Co. needed away to upgrade their system into an automated, consolidated, and standardized. That way, corporate and business units would be able to quickly and easily view crucial information at both a detailed and broad level, allowing them to manage effectively and respond to any potential problems or risks immediately. Leverage PREDICTif’s recognized experience and expertise to implement a business intelligence solution tailored to JB Poindexter and CO.’s needs. Purchase multiple IBM Cognos Express modules. Consolidate, standardize, and automate reporting and forecasting processes across all distinct business and corporate units. Implementing IBM Cognos and PREDICTif services, provided end users with an intuitive budgeting, forecasting, and reporting solution with BI capabilities. Created a system of easy-to-understand dashboards that automatically provide critical information across all business units, allowing management and corporate to assess performance and risk in a timely manner. Implemented a cost-effective solution, saving $50-75,000 a year in hardware costs alone. Eliminated the need for report builders by empowering end users with an easy-to-use system. Allowed IT staff to focus on IT needs instead of spending several hours a day loading data and fixing reporting issues. Reduced time to deliver manual reports by well over 200%. Upgrade and consolidate budgeting, forecasting, and reporting systems into one easy-to-use solution, IBM Cognos Express. Using IBM Cognos Express, significantly reduce manual reporting from the separate business units by over 200%. Generate consolidated, standardized reports that include product line costs and margins, fast and efficiently to make better business decisions. Create easy-to-use reporting dashboards across all business units and corporate units, so that all levels of management can assess performance and risk in real time. Employ PREDICTif Solutions consultants to install a cost-effective solution, and even complete phase one of the project early and on-budget. Leverage PREDICTif’s proven expertise to build a solution specifically tailored to J.B. Poindexter’s needs. As one of the leading global equipment service and pipeline construction companies, the customer faced numerous challenges related to monthly financial consolidation processing. 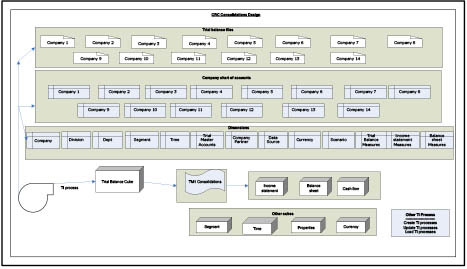 In preparation for the opportunities and demands of being part of a publicly held company, the customer and its 25 plus legal entities had to manage all of their financial operations in a multicurrency environment, transforming individual financial statements from a group of entities into a single financial statement. Their legacy solution which consisted of putting consolidated statements together using spreadsheets had severe limitations. Currency translation with exception rates for items like intercompany receivables and common stock became a maintenance dilemma. Efficiency, user-friendliness and self sufficiency were the three main objectives of this project. Establish self sufficiency so that the customer’s business users can easily support and upgrade the solution independent of its IT group. PREDICTif was engaged to provide an end-to-end solution and after evaluating several potential software vendors, IBM Cognos TM1 was selected for a number of reasons most notably, the ability to provide a real-time approach to consolidating, viewing, and editing enormous volumes of multidimensional data. Cubes having dimensions ranging from 3 to 10 were created. GAAP entries, Eliminations and Adjusting entries were made through the TM1 Consolidations product. Reports created both in TM1 and Excel were readily accessible through the web with no additional effort. The customer found out that it could eliminate numerous steps from the process itself further contributing towards more time on analytic activity rather than the mechanics of generating month-end reports. PREDICTif provided a training curriculum that was tailored to the customer’s needs and culture. Power users received comprehensive technology and solution specific training and as a result, quickly became proficient enough to instruct other end users. PREDICTif delivered significant value to the customer’s return on investment related to the software and IT infrastructure investment. The solution received positive feedback from the customer’s user population and significantly improved the financial consolidation and reporting process. The customer’s finance group uses, supports and enhances the solution without dependence on the IT support. A global major integrated energy company. As one of the world’s largest integrated energy companies, our customer conducts business in every aspect of the crude oil and natural gas industry, including exploration and production, manufacturing, marketing and transportation, chemicals manufacturing and sales, geothermal energy, and power generation. Our customer sought an enterprise solution to track key financial and operational KPIs. There was 1-2 day of data latency, and as a result, the reports did not contain up-to-date information. The customer’s requirement was to create an enterprise level dashboard that tracked key KPI’s against their Actual, Planned and Scheduled Metrics. The scope also included the creation of dashboards and scorecards to give a high level representation of critical operational data. Improve collaboration — use metrics to link together people, departments and processes. After evaluating several world class solutions, IBM Cognos BI was selected for a number of reasons – one of which being IBM Cognos BI provides a highly customizable and informational dashboard and scorecard solution. Cognos metrics studio, metrics designer and framework Manger version 8.4 provide needed metrics functionality to meet the requirements. PREDICTif was engaged to provide an end-to-end BI solution and develop Refinery Metrics and Balanced Scorecards using Cognos Metrics Studio/Metrics Designer 8.4. Trained Administrators, BA’s and Developers to maintain this metrics model and package and also them on used metric studio. PREDICTif delivered a Cognos BI solution that increased the visibility to significant business events and enhanced the customer’s ability to detect and resolve business issues and maximize market opportunities. The customer was able to support and upgrade the solution independently after PREDICTif provided extensive and specific training and detailed documentations.